Many people are concerned about the large pores, whiteheads, blackheads these days. Oily skinned beauties have to deal with all these issues while making sure that they also don't have acne. I have been working hard on my skincare routine since one year and have been seeing good results of it. Let me start about how some products were truly game changer for me. I have been using gel based moisturizers since many months, to be honest I will complete one year of using gel moisturizers. I also had recently posted about how to get rid of black heads wherein I shared my experience of getting rid of black heads. Please remember, pores are not going to reduce in a matter of days or even weeks. 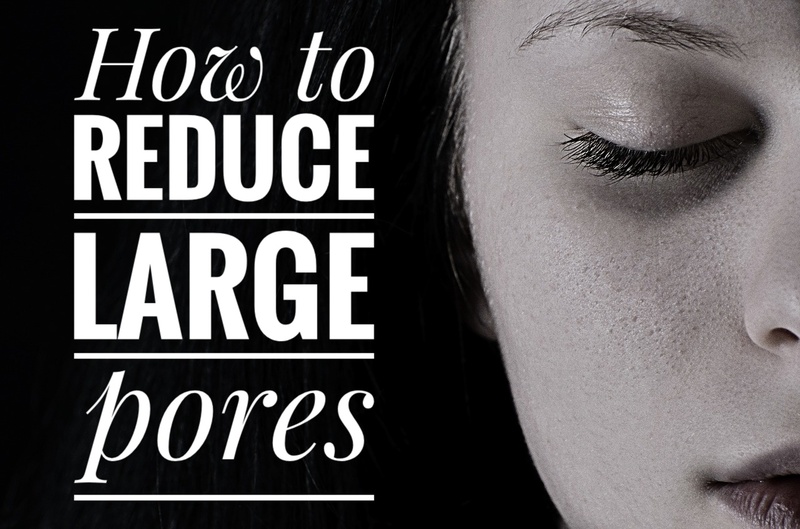 It will take a few months to follow the above-mentioned routine to see visible changes in the pores. Also please remember, it's impossible to fully close your pores or absolutely diminish the appearance of pores, all we need to do is reduce the dirt, sebum in the pores and keep them clean. What are large, open pores? Large or open pores are nothing but sebum, dead skin cells, dirt accumulated in the pore. Pores cannot be opened or closed. 1) Cleanse, Cleanse, Cleanse. If possible Double Cleanse!! Probably this is the first and most likely advice you will receive for large pores and white heads. Cleansing is the first step to get the junk out of the skin and keep the pores clean. Following a cleansing step is absolutely necessary. Most of the people often follow double cleansing as a part of their PM routine to get rid of the junk and dirt accumulated in a day. It's an utmost necessary step, don't end up just using a face wash to cleanse your skin. Check next step for further details. Clay masks pull out the dirt like a magnet and help in detoxifying the skin. Using a Clay mask for oily skin on a weekly basis is a must for detoxifying, rejuvenation of the oily skin. I prefer using Plum Green Tea Face Mask which has glycolic acid too along with bentonite clay, so it's a win win for my skin. Using gel based moisturizers was a game changer in my skincare routine. I have been using aloe gel since last year to moisturize my skin, but over a period of time I got to know, oily skin needs much more than just a gel. So when I bought SoulTree Tulsi Sandalwood Moisturizing Gel I was amazed at the effects of it on my skin. So, ditching the so called light weight creams for your oily skin will definitely be good. It's like allowing the skin to breathe, moisturize and at the time keeping pores clean. Massaging the face is one of my favorite skincare rituals. Using a good face massage technique and a good massage cream goes a long way in relaxing the facial muscles, boosting the blood circulation and getting rid of excess dirt in pores. I follow Corallista video for a face masage technique and I can literally see the wax like sebum from my pores in my hand while massaging the face. Face massage also reduces the age lines and fades acne marks. Personally speaking, I have seen huge difference in the appearance of pores by just following a regular CTM routine and using gel moisturizers. You can also steam your face to melt down the junk in pores and remove it. Do follow the routine and let me know if you have any questions in the comments section below.